What Car Is Most Likely To Be Driven By A Murderer? Approximately 490,000 people were murdered worldwide in 2004, (7.6 homicides per 100,000 people). Many probably drove to the murder site. That got us thinking — what car is most likely to be driven by a murderer? 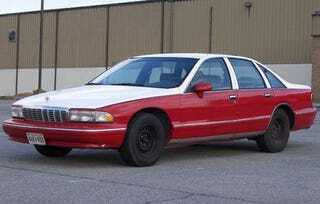 In our estimation, it's hard to top a Chevy Caprice. Ignoring the Beltway snipers, who chose a 1990 vintage, murderers aren't so different from us... except they're a little crazy. You'd expect them to drive a midsize sedan but, not like a Toyota Camry. You'd expect something a little different. A little older. Beaten up. If it's a decommissioned police car, even better. It's cheap, it has a big trunk, you can find one with a V8, and it conveys the kind of authority murderers like to believe they have. If you see an old Caprice Classic rolling down the street on corroded steelies with a shifty-looking driver behind the wheel, we suggest you run. Run like hell. What say you?